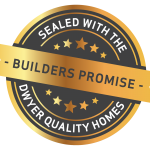 At Dwyer Quality Homes, we know that building your dream home can be one of the most exciting yet personal experiences of your life. That’s why our team of experts are here to work with you and design a home which suits your individual lifestyle and budget. The real magic begins once you have locked in your block of land and have a budget mind – because now is the time to sit down and custom design your dream home! Follow the builder’s footprints around our 6 step Build Process to discover how easy building a custom home with Dwyer Quality Homes is. Every home we build features products from the most trusted brands and quality suppliers as standard. Create your custom package below!